Our guide, Rick, was the best....knowledgeable, funny, efficient, considerate, responsive. Made the day really vibrant, interesting, great fun. The tour was comprehensive and fascinating , and Ricks extensive knowledge of the flora, fauna, and history made Bruny island really come alive. Such a great day. Many thanks ! The whole day was fabulous. We were only a group of 15 which meant we could easily interact with other guests. Our guide, Rick, provided interesting information throughout in a pleasant, humorous way. Stopping to taste locally produced foods - oysters, honey, chocolate etc. - was very enjoyable, as was our seafood platter for two at the Bruny Hotel. The trip to the spectacular Bruny lighthouse was enjoyed, including the commentary - not for those afraid of heights though. The tour was very well organized and met our expectations. Sam was very knowledgeable about the Island and shared his expertise in an entertaining manner. 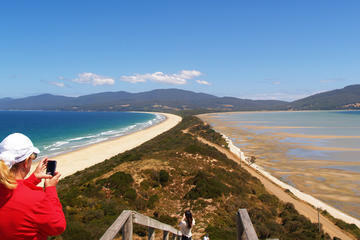 We really loved our visit to Bruny Island and Nigel our tour guide was informative, helpful and humorous. We saw so many beautiful areas, the highlight for us being the lighthouse and guided tour of it. It was a heatwave and our guide and frozen bottles of water, air con and frozen face wipes to keep us cool. The stops along the way were all scenic and enjoyed tasting all the honey, cider, chocolate and cheese! Value for dollar, this is one of the best tours we’ve ever experienced. Rick, you made my family’s trip to Bruny Island the absolute highlight, your knowledge and passion for this place is unsurpassed, and your joy and Joie de Vivre is totally infectious! !Trying to pick favourites of the day is hard, but the oysters and cheese at Two Tree Point is definitely up there. While we didn’t see any white wallabies, the grey ones are super cute, and the personal touches of plant identification and stopping for that rogue echidna were greatly appreciated. (As was you kindly stopping for my selfie with a Blackwood - Acacia melanoxylon - tree!!! )The views from the lighthouse were breathtaking, and the efficiency of the tour was freakin great. Lunch was perfect (I’m still dreaming about that seafood platter!!!) thank you Dave and co. at the Bruny Hotel!!! The cider tasting was a delicious way to end an already delicious experience. The tastings at the chocolate factory and the honey farm were just icing on the cake, and the views from the steps was the cherry on top. I’m already saving for an overnight tour, as I am now obsessed with Bruny, and just want to know more and experience more beauty this special place has to offer. We cannot thank you enough for this trip. See you next time!!! Excellent day, great food and beautiful place. Rob tge guide was very informed and informative. Also very patient! 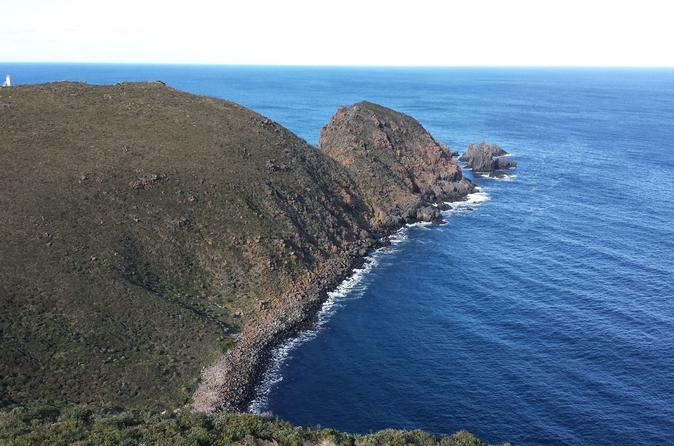 We loved our trip to Bruny Island with Rick as our guide. He knows the island so well because it is his home and we were the beneficiaries of his knowledge. The various stops for treats to eat were great and the oyster lovers were blessed. We were prepared for a cool day but the sun came out and it was glorious. Thank you Rick for making our visit memorable and fun.